Ergonomics is an applied science concerned with designing and arranging things people use so that the people and things interact most efficiently and safely — also called biotechnology, human engineering, or human factors. 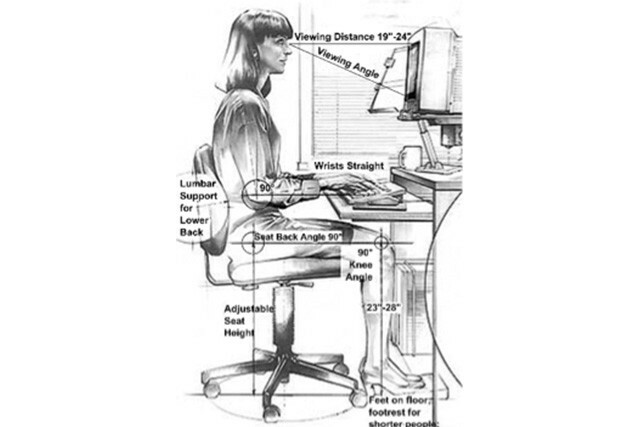 Ergonomics affects all ages, all professions and all aspects of daily living. The goal is to monitor all work activities that permit the worker to adopt several different, but equally healthy and safe postures. Identify where muscular force has to be exerted, localize it to the largest appropriate muscle groups available. Where motion is performed, target the joints at about mid-point of their range of movement, particularly for the head, trunk, and upper limbs. Time is money! Distance is time! If the equipment happens to be “X” millimeters wider/longer/taller/shorter, and, this results in an increase or decrease by “Y” milliseconds to complete a task, what is that cost or gain to the operation? Although a few mm or ms may appear insignificant initially, an increase, positive or negative, by example, reduce or add 400 milliseconds to complete a task (the time it takes to blink), repeated say, 1,000 times per meal period, that’s 400k milliseconds for the meal period, about 6.7 minutes. 6.7 minutes, no big deal, right? Then, multiply this by three meal periods and that’s 20 minutes per day. Still not a lot of time but you could get quite a bit done with 20 minutes of “found time” each day. Let’s take this example a bit further. 20 minutes a day translates to 7,300 minutes per year, 122 hours. Over a seven year life-span for the piece of equipment, that totals 850 hours +/-. If the average wage is $15/hr, that’s $12,750. You can add or subtract this from your TCO to help make your decision. Considering this one example, multiplied by each work station, for multiple tasks per station, and suddenly, you have good reason to look very closely into the ergonomic impact of every piece of equipment. Also, imagine if you could reduce one call-off per year per FTE due to reduction in back injuries, that’s another 56 hours added to your bottom line. How about one less “call back tray or courtesy tray” per meal period? … that’s $15/day, $450/month, $5,475/year in direct cost savings. There are solutions, the Alexander Technique, a training program to help individuals to better understand how their bodies react to work/stress and how to avoid habits that negatively impact their well-being. Previous post: Parsley, Carrot Curls, Radish Flowers, Oh My!